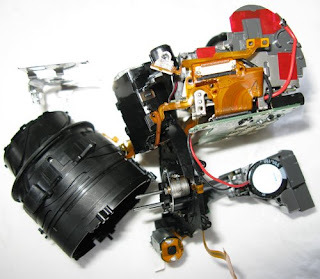 Seeing the camera is busted and I have nothing further to lose, I took it apart. The process is pretty straightforward. 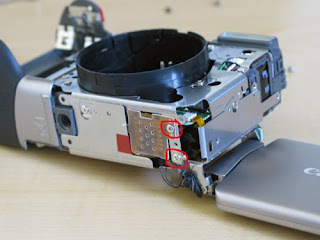 I looked at the parts of the camera and how they come together, took the screws out, wiggled it to see what else is still holding it together, unplugged a few connectors, and got to the lens. The tricky part is making sure you remove as few screws as necessary so that it's won't be any more complicated than it needs to be. Turns out the flimsy plastic that is used to guide the lens broke when I dropped the camera. I glued the piece and put the camera back together. Keeping track of the screws is difficult and I am sure I used the wrong screws in some places but I did put the camera back together. Except for two screws that were left over. 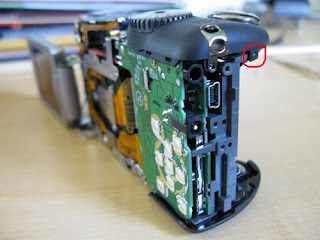 Nonetheless, the camera looked solid, so I ignored the two screws. I held my breath and powered the camera. The only problem was that even though the lens moved fine, it made a terrible noise. Also, I soon found out that the camera did not focus well in video mode anymore. The LCD started going white a few days later. 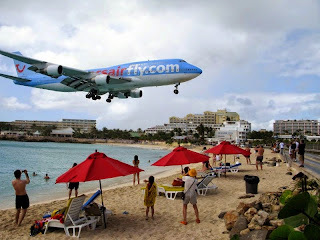 St. Maarten has a world-famous airport with a runway that ends right next to a beach, so planes land very very low--to everybody's delight. To make it even more exciting, they also land 747's on this runway! I looked up the flight schedules hoping a 747 would land during the four days I was in St. Maarten and sure enough there was one scheduled for the second day. There I was on the beach with my girlfriend admiring all the small and medium planes landing that afternoon as the weather alternated between sunshine and small showers when the big one finally showed up on the horizon! Everybody scrambled for what they considered the best photo spot and got ready. Literally three seconds before I wanted to press the shutter, the LCD went white! I fumbled with it for a second, gave up, looked through the viewfinder that was half blocked by the filter adapter and instinctively pressed the shutter three times as the plane approached the beach and passed over it. I followed it with my gaze as it landed and slowed down to taxiing speed. I got back to my camera and realized it's time to go St. Maarten's famous shopping strip and buy a new camera--pronto! Later, I found the LCD worked when undocked a bit but whenever I clicked it into the holder, the LCD turned white. For all the bad timing, I did get the shot! http://www.panoramio.com/photo/8273379. Then I got a replacement camera. 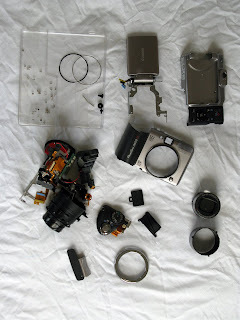 I took the camera apart a second time after I returned home from vacation. 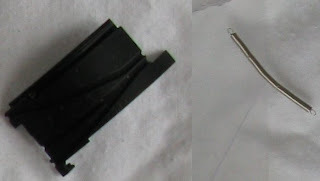 This time I managed to break one of the two ribbon cables that go into the lens assembly. Fate sealed! I reassembled the camera and this time I found myself holding ten screws I forgot to put back in, but the camera was still holding together well! 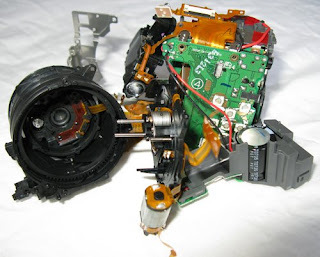 What follows is my guide in words and pictures to taking this camera apart. Read it over before starting the disassembly. - Set of small screwdrivers. The screws have Philips heads. 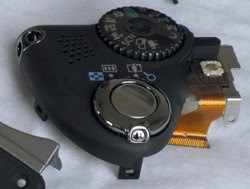 A thin flathead screwdriver is useful for prying apart the plastic latches in the camera. - Can of compressed air. 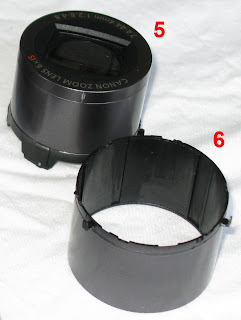 Take off the filter adapter silver ring around the lens by pressing the button next to it. Look at the camera from every angle and take out all the screws you can find. You should come up with a system to track where each screw came from because the screws that you will remove have several types of threads and several lengths. For each screws or group of screws, I ripped a small piece of paper and wrote on it where the screws belong. I formed it into a "container" by creasing it with my thumbs and my index fingers. The problem is that halfway through, you don't know how to name the locations anymore. Probably the easiest thing is to print the images on this site and number the screw holes in the pictures as you remove each screw. 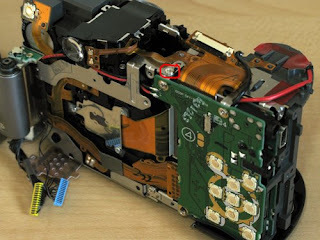 This will also make sure you put all the screws back in when you re-assemble the camera. While you're at it, also remove the ribbon cable that you see in the corner next to the yellow and the blue connectors. NOTE: This is the bad way to discharge a capacitor because it creates a very large current for a brief period of time, possibly destroying the capacitor. You're better off using a resistor to drain the capacitor over ten seconds or so. Take out the screws that hold the viewfinder in place. Slowly play with the back cover of the lens assembly. It's held together by a few latches so try not to break them. I broke one or two but I reassembled the lens assembly without any problems. The back cover snapped back into place. Taking apart the lens assembly is by far the trickiest and most painstaking part. 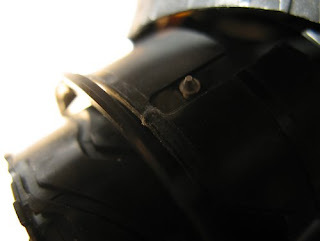 The lens assembly is composed of a few plastic cylindrical pieces that have diagonal tracks to guide the other cylinders. When one of the cylinders reaches the end of the track, it pops off because the end of the track is open. Try to remember how every piece looked and fit in before you remove it. It will save you a lot of time and frustration. Note, Piece 4 can be decomposed further. Also, be very careful with the two ribbon cables that go into the lens assembly; I managed to break one of them at some point. I moved to another house while the camera was apart, so I stored everything in a few plastic bags and when I took them out two weeks later, one of these two ribbon cables was ripped. It's also useful to have a can of compressed air to clean the lens of dust as you are reassembling it. As you see, I removed 37 screws to get to this point. The plastic here doesn't work well with Crazy Glue. One solution is to go to CVS and among the instant glues they sell is a brand of glue that is packaged together with a tube of primer. The primer made the plastic surfaces hold together much better. 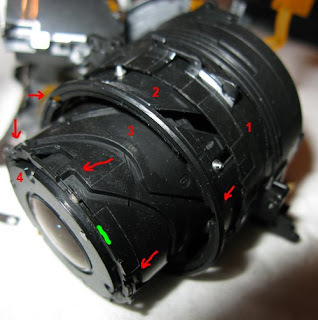 Rotate all the pieces back into place so the lens assembly shrinks into the retracted position. Place the three gears inside and snap the back into place. 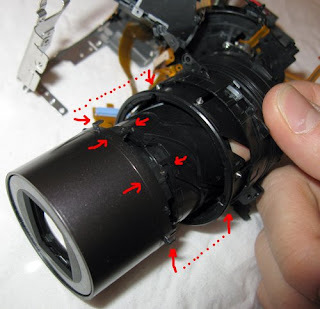 To complete the lens, put the cover with the spring back in place--without permanently deforming the spring. Now go the steps in reverse order to re-assemble the camera. Question: from the first pictures here I see that the lens are off at very beginning. 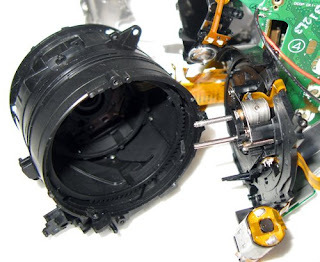 Is there a way to remove the lens before taking apart the camera itself? No, you can't take out the lens at the beginning. The lens is the last part that comes off. It is missing in the pictures because I took the pictures after I took the camera apart and I didn't have the patience to put it back in before taking the pictures. Do you know what ribbon cable sends signal (or gives power) to shutter mechanics placed in lens group? I have a problem with another camera - Pentax Optio 50 - it don't open "the eye" in lens group - i.e. if you take a look in depth of lenses (camera is "on", lens group moves OK) from camera front side you'll see that it's closed and never open even if you press shutter button. You get just black pictures, because there is no light to CCD - the way for light is always closed. Normal camera have this "eye" open and make "blink" while taking a picture (it was checked with the same working camera) and while camera is "on" the light goes to CCD through lenses and you can see the resulting picture on LCD screen (and viewfinder). My camera just stop working without some special reason, except maybe it was 10-15 minutes under the sun in its case and in a plastic bag - when I took it to make some pictures it was warm and all the pictures I've got was just black (previous pictures looked fine in playback mode on LCD screen). And when camera is "on" LCD screen also black but I can make zoom and see that it works in viewfinder (lens group moves). It seems like everything works except this shutter mechanics - maybe just some cable breaks or disconnect and there is no power for this thing? 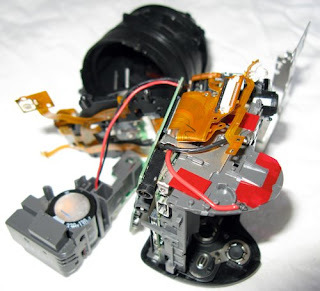 You disassembled your camera completely and probably you can make an advise for this kind of problem (though my camera is different, but I think almost all of them have similar architecture solutions). Do you have any photos of the 4 pieces that make up the lens cover? 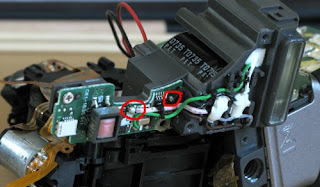 Is there any way to get to those without removing the lens assembly? Completely coinsidental I bought an a650 yesterday at the fleamarket here in Amsterdam (Waterloosquare/Waterlooplein) for 20 euro, complete in box, booklets, cd etc. Sadly it suffered the same fate as yours, including the broken tiny flatcable, zoombarel tilted and stuck. First thing I did when I got home was get out the little phillipshead and got unscrewing, simmilar to your procedure. After a while I concluded I had to find a new lens unit and got to googeling, didn't find any but came across your story (effort and energy you put into it is much apreciated). Now for my question; didn't you try to find a new or used but complete lens unit? You probably did, but with the same result as I got. So if you got any tips finding one???? Thanks and greetings from Holland. If the lens cable breaks you have to solder a new one in place. The camera side end of the cable looks a lot easier to solder than the lens side end of the cable. oh, do you still have parts? also, i'd like a bit more dissassembly information. i'm modifying my a650 so i can automate it. i'd really appreciate it if you'd drop me an email at mwk206@nyu.edu. 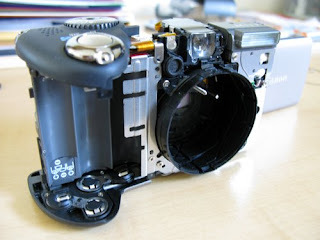 great guide, but I have an A620 that I am trying to replace the lens cover. any comment to this lady's question? "Do you have any photos of the 4 pieces that make up the lens cover? Is there any way to get to those without removing the lens assembly? November 7, 2008 5:54 PM"
I would imagine (perhaps a mistake on my part) that the process would be similar between an A620 and an A650? Thank you very much for the pictures. They were so helpful to me in fixing my a630! You are a very determined man, congratulations! Wow, thank you Heliodor for the extreme detail in explanation and pictures. I have a A650 and have a small hair and dust behind the first lens. I have tried to clear it with canned air and the hair does seem to move but appears to be stuck. 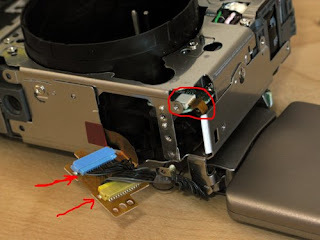 Is there any way I can remove the lens assembly to clean off the hair and dust, I believe it is labeled 5 in one of the pictures, without disassembling the entire camera? Thank you again. 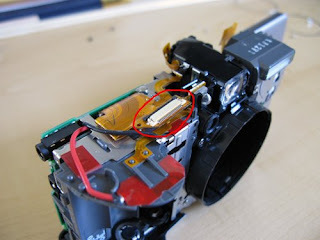 i have change full lens block on to canon powershot a650. Now can't focus on infinity. How can solve this problem?